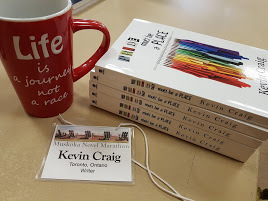 And, once again…a huge thank you to the organizers, volunteers and my fellow writers at the MUSKOKA NOVEL MARATHON! Burn Baby, Burn Baby will be my 4th Muskoka Novel Marathon novel to be published (Sebastian’s Poet, The Reasons, and, Half Dead & Fully Broken were also MNM novels). Burn Baby was written during the 2012 MNM. It’s gotten to the point where I’m not quite sure I can even write a novel without doing it in a marathon setting. The Muskoka Novel Marathon, for those who do not know, is a novel writing marathon that takes place in Huntsville, Ontario, every July. It’s a 72-hr marathon and there are usually about 30 writers on hand at each one. The writers each write a novel during the course of the weekend marathon. The most important part…it’s a fundraiser for literacy. Every writer in attendance gets sponsorship pledges, just as one would do for any fundraising marathon. All funds go to the YMCA of Simcoe/Muskoka Literary Services. The tagline for the marathon is, WRITERS SUPPORTING READERS. Over the course of the marathon history, there has been close to $100,000.00 raised to help fight illiteracy. That, in itself, is worth it. But the benefit to the writers in attendance is IMMEASURABLE! It’s truly a magical weekend. I would recommend the novel marathon experience to writers everywhere. This announcement comes on the heels of my announcement for the sale of HALF DEAD AND FULLY BROKEN! Burn Baby, Burn Baby will be published in the Fall of 2014. Previous Post The Secret Passage that Led Me Back to My Middle Grade Novel!